The flags in this category are slightly different from the other flags on this website. On this type of flag, the flagpole only goes half-way across the top of the flag. Draw attention easily with with a giant message flag! Great for the front of your business or out by the road, these flags flutter & flap with a slight breeze. Draw attention easily with with a giant message flag! 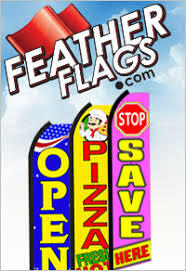 Great for the front of your business or out by the road, these flags flutter & flap with a slight breeze. This swooper flag, also called a feather banner, has a vibrant colored background with bold graphics and text. 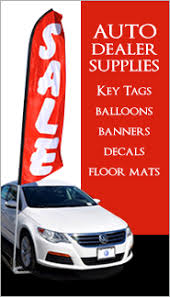 Attract attention easily with with a giant message flag and get your business noticed. This ground-spike is specially designed to be used with our swooper flagpole set. Use this item when you want to install your swooper flag into a grassy area on your property. Made of anodized aluminum, this base will not rust. Use a mallet or hammer to pound spike into ground. This ground-spike is specially designed to be used with our swooper flagpole set. Use this item when you want to install your swooper flag into a grassy area on your property. Made of anodized aluminum, this base will not rust. Use a mallet or hammer to pound spike into ground. This swooper flag, also called a feather banner, has a vibrant colored background with bold graphics and text. Great for the front of your business or out by the road, this flag will flutter & flap with a slight breeze. This swooper flag, also called a feather banner, has a vibrant colored background with bold graphics and text. Great for the front of your business or out by the road, this flag will flutter & flap with a slight breeze. Use this handy pump to inflate or deflate your reusable balloons. Plugs into a regular household outlet. This kit will ship in Multi-Color as shown in picture. Color: MulticolorItem shipped as shown in image. Item shipped as shown in image. This FastFlow™ High Performance Electric Balloon Inflator combo Deflator makes inflating our HeliumFree™ Outdoor Balloons fast and easy! Designed to fill each large balloon in under 30 seconds! For use with BalloonBobber®, BobberMAXX®, and DuraBalloon® products!